The majority of the wooden legs and castors for furniture, which you can buy from Heritage Upholstery Supplies, come with a dowel (hanger bolt or rod protruding from the top of wooden legs) and T-Nut fitting, in line with the standard fixings for the furniture industry worldwide. For example, the dowel (hanger bolt) fits sofas, chairs and beds from IKEA, department stores, DFS, and virtually all of the major retailers of furniture, including high-end independent, bespoke manufacturers, wherever you are in the world. Many customers prefer to simply order our furniture legs and screw them in by hand, straight out of the box, using the existing fitting embedded in their furniture. Exclusively for Heritage Upholstery Supplies customers, sets of legs can be customised, choosing 8mm (UK), 10mm (European) or 5/16 (United States) dowel widths to suit the existing fitting, and remove the need for any DIY. Our Free Samples Service enables customers worldwide to check their existing sofa, chair or other furniture fitting, so that they can order furniture legs confident in the knowledge that the set of wooden legs purchased by them will be tailored to fit their furniture. T-Nuts to match your dowel size of choice are supplied free of charge with all sets of furniture legs. Customers in the scenario above are unlikely to use these, they will not need them. Customers who do not have an existing screw fitting in their furniture can use the provided T-Nuts, or select one of our alternative fixings. Felt pads are advised to protect wood or hard flooring and glides to prevent marking on carpets. Brass castor cups are also available for wooden legs with castors. The vast majority of customers use the service detailed above. However, some of our customers do not have existing fittings as detailed above, or they prefer to fit the wooden legs themselves, or one or more of their existing fittings is damaged. If one of these scenarios is the case, our wooden legs will still fix to all sofas, chairs, beds, and other furniture using the free T-Nuts provided with each order, or one of our fixings. These alternative fixings are tailored to take an 8mm (M8) dowel screw, so please choose the default 8mm dowel screw size when purchasing furniture legs. For customers new to this type of project, a basic step-by-step, how to guide is provided below for easily fixing your new wooden legs or castors using a T-Nut. 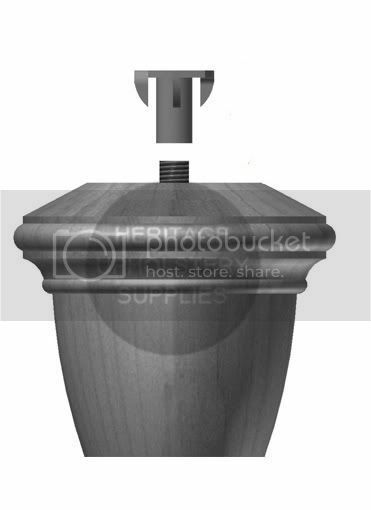 The wooden legs and bun feet come with a dowel already inserted, and protruding from the top approximately 30mm. Many customers cannot access the inside of the furniture frame to fit a new T-Nut. There are three main alternatives, all to be used with an 8mm dowel screw. The most popular is to use a Universal Fixing Plate. Simply, screw the plate to the corner of the frame. Screw in the wooden legs by hand. Alternatively, the situation may be better suited to a D-Nut or D-Nut with Screw Flange. Castors are available with brass or chrome screw fixings. Simply lower the tapered leg into the castor cup (some shaving may be required if it is not an exact fit), and use a screwdriver to secure with the three screws provided, through holes at the side of the castor cup.